Theaster Gates has been dubbed "the real-estate artist," "the opportunity artist," "an anthropologist, urbanist, activist -- the 21st-century artist," "the poster boy for socially engaged art," #40 in Art Review's "2013 Power 100, A ranked list of the contemporary art world's most powerful figures," and even "the Mick Jagger of social practice." His works include his signature Dorchester Projects, 12 Ballads for Huguenot House and numerous others. In 2013, he was named a United States Artists fellow and also received the inaugural Vera List Center Prize for Arts and Politics. There are many more accolades than I can name. 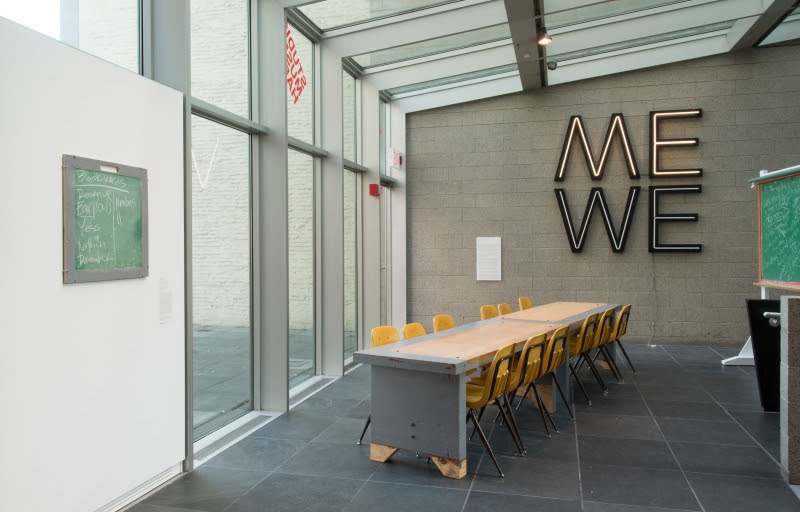 So when I went to the Studio Museum of Harlem on January 16th for the activation of See, Sit, Sup, Sip, Sing: Holding Court (2012) -- tables, chairs and desks salvaged from a now-closed public school on Chicago's South Side, I believed the hype but still wasn't sure what to expect. Gates was there to activate the piece on display in the museum's atrium as part of Radical Presence: Black Performance in Contemporary Art, an exhibition that originated in Houston and was organized by Valerie Cassel Oliver. The New York show, curated by Thomas J. Lax, opened on November 14th of last year will be closing on March 9th. This event was billed as a performance: "designed as an experience for learning created by the people assembled in and around it, the installation will be a site for engaged conversation and dynamic interaction." While, the potential was there for this moment to be more communal and interactive, in the end, it was about Theaster's way; a Whitmanesque "song of myself" from a man who unquestionably contains multitudes (conceptual artist, urban planner, performer, etc. etc.) and is currently negotiating, or "leveraging" as he says, the value of his capital with keen awareness of the temporality of this moment. "I'm holding court," Gates announced as he rushed into the room. Late, held up by traffic. "Ask me anything." We were all initially silent. He expertly coaxed out questions from the reserved audience of predominantly "museum people" and a few practicing artists in the first hour. By the second set, which was open to the public, he was clearly in his zone. The brevity of the event, however, certainly did not diminish the intensity of the encounter. Au contraire, the conversation that ensued was charged, even when the tone was light, as he exposed his motives as well as how he "leverages" what it means to be a sought after commodity in this market economy. I am not convinced the circulation of capital can actually be affected by this. Is it an effective intervention? Gates is also driven in part by a spiritual imperative, which he alluded to in his own introduction and again when he talked about the Black Monks of Mississippi, the experimental ensemble he performs with at times. As his work continues to gain attention, he is too aware of the possible effects of viewers' gaze on their expression. This articulated determination to keep that which they create their own, as they pursue the ecstatic. "Mississippi is my Africa" (AKRiFa. he wrote on the makeshift board). Misspelled? A pun? Who the hell knows? That was his response to being asked where is home and, "Where are you from?" Theaster's drawn out answer was eventually punctuated with this unexpected assertion. Noting that in the past he had feigned different identities, laying claims to elsewhere as points of origin, he articulated an ancestral/generational right to this place. There was a note of affirmation with this claim -- a not so subtle discard of the qualifying hyphen. A re-routing and re-rooting beyond the crossing. Blackness made here. Homegrown. And nothing reinforced this rootedness more than when Dave the potter responded to a query regarding just what is Theaster's work. Dave announced himself with a growling chant that stems from that real deep place in the gut where fear and excitement reside side by side. A riposte? An affront. Exposure of the raw in mixed company. "Just a little, but not too much." Gates said. An off the cuff commentary on the measured ways that presentations of blackness must be negotiated to not offend white sensibilities in an art world that continues to be a bastion of whiteness even in one of the most ethnically diverse cities as NYT art critic Holland Cotter recently noted. It is a world possessively invested (to paraphrase Georges Lipsitz) in the normative that ascribes value to the unfamiliar only when it becomes chic and catches on. And there can be only one at a time thus prompting the recurring yet archaic question, but is it art? whenever it is deemed deviant. "Everything is raw material to me," Gates mused, entertaining a question concerning his process. He said this most emphatically, inspiring a collective meditative pause. "Land is raw material... I take one form and transform it into other forms," he asserted. Indeed, for those among us who have inherited sacrifice, the tools and stakes of the trade have never been quite the same. Thus, illimitability even as a prospect is not only seductive and worthy of exploration, but also potentially transcendental. I dare to wonder just what would this Gates do without the burden or constraints of being what the late poet June Jordan so aptly called a "representative other." What would Theaster do as an artist who "would like to make a pot, just to make a pot."